Zooniverse Comic: Second Edition Printing! Finally, 50 copies of the Second Edition Zooniverse Mini Comic #1 and #2 are in my hands! Those of you with First Editions are now collectors, only 50 copies are ever printed for each edition (because that's all we can afford to do right now). So congratulations and thank you for supporting my work! Box O' Zoons! Edition #2 hot off the press. One of the most important edits was to fix Snok's gag line. 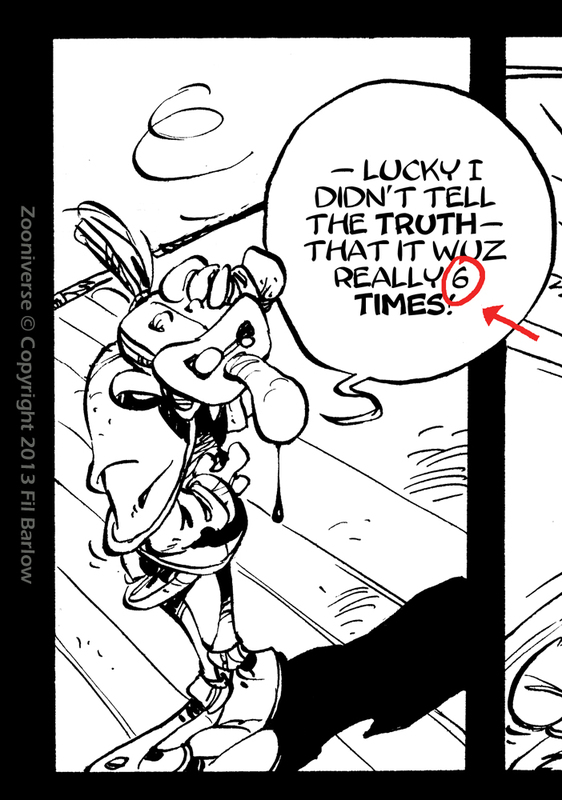 The number '6' was left out of his dialog in the first printing. When I originally created my font I didn't have numbers but decided to block out the text anyway. After the font was completed I went back over the comic adding the numbers but I missed this page and ruined the gag!! If you have a First Edition copy and there is a '6' that's because I've added it by hand, but I often forgot to do it, so sorry about that. The fix on Snok' line. There is also the addition of a new page in issue #2 which was intended to be my animation submission to this month's Loop De Loop's theme: "Black and White", however I was unable to complete the animation in three weeks. It focuses on the Temptors who try to distract the Notator from finishing his sacred comic. So ironically life imitates art. The Temptors made it into print at least, but animating them would have been a nice tie-in. The new page on the left in the 2nd Edition. There are 30 years between the art on the two pages. I wanted to be as faithful as possible to my original designs of the Temptors and the Notator, I was 20 years old when I did the art as a one-off with no story concept or even names for the characters. Three decades later, I found myself over simplifying their shapes which were complex and hard to imagine from different angles. So I spent a few days sculpting their heads, the results helped me understand how the shadows fell across their unusual shapes. Sculpts of the Temptor and Notator. 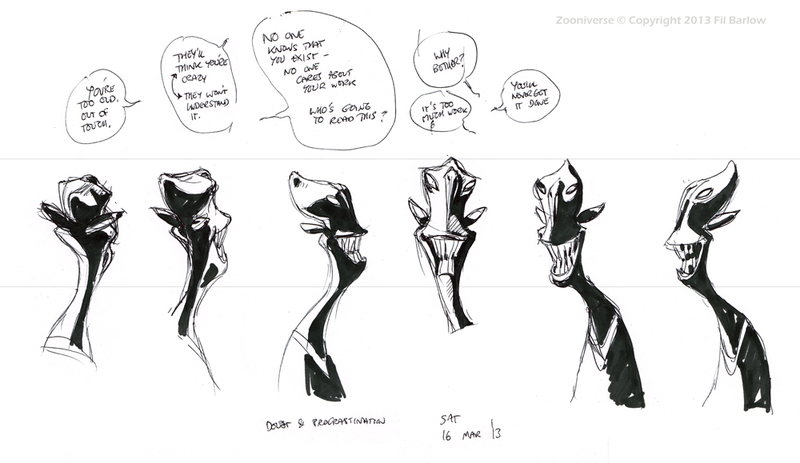 I then made a series of study sketches, practicing drawing them and prepared turn-arounds for the animation. Temptor turn-arounds with shadow studies. Once I realized that I wasn't going to make the Loop De Loop deadline I spent the last weekend coloring the scene up, it looks sumptuous now, I'm really happy with it! I intend to animate the sequence and all of the assets are part of a new Zooniverse comic that I am currently working on for Brandon Graham's new venture. You will see the colored version in good time, but not yet. Meanwhile I am more than halfway through Zoonimini #3 which begins the reprint of the original Zooniverse series. I intend to release issue #3 and #4 together. So please know that if I ever go quiet from social media it's because I'm busy, so don't despair I always resurface with new material!! Not anymore!! This edition saves me from the dreaded number "6". Now I can get back to signing and drawing little Zoons on peoples purchases. where can one view the animation? Hi Tony, unfortunately Loop De Loop took down my animations, I'm working towards re-relasing them myself. It's one of the reasons that I set up a Patreon to help fund the work.